Antitanque con cañón en torreta giratoria. Fue una modificación inicial de una artillería pesada que pretendía luchar en la Línea Sigfrido. The T28 Prototype has a great gun and good accuracy, and a rather good ROF. Like the T28, the Proto is very very slow, if caught in the open there is no chance to survive and reversing will do no good. You do have good armor; however it is not as good as the T28 and has an open top, making it more vulnerable to HE and artillery. Do note that although it has a turret, it can not rotate 360° and is very slow, meaning it will not help much against circling enemies. You should aim to unlock both guns before moving on to anything else. The starting gun is inadequate, while the 120mm makes you a destroyer of worlds. Next you should aim for the radio to allow you to pinpoint where you are needed on the battlefield, as your slow speed makes you committed to whichever route you take. In 1945, a turreted variant of the first T28 was planned. It was planned to mount a big, heavily armored, limited-traversed turret that can only traverse 286° degrees. The planned turret armor ranged from 4 inches (102 millimeters) to 8 inches (203 millimeters). The gun to be mounted was the 105 mm T5E1, the same gun the T28/T95 had mounted, and it can elevate 15° degrees, and depress 10° degrees from the turret. The suspension was changed to use the M4A3's Horizontal Volute Spring Suspension (HVSS) because the Vertical Volute Spring Suspension (VVSS) proved to be obsolete for the tank's weight. The HVSS suspension proved that it distributed weight more widely. Planned hull armor ranged from 2 inches (51 millimeters) to 8 inches (203 millimeters). The tank was planned to use the same engine as the T28/T95 had used, the Ford GAF, a V8 gasoline engine which produced about 500 horsepower. The tank housed a crew of five. No prototypes or blueprints were ever produced. This was because during the later stages of T28 development and evaluation were overtaken by that of the T29 and T30 turreted heavy tank design. The T29 mounted the same gun as the T28 in a conventional rotating turret. The T30 was developed with a larger-caliber gun and more powerful engine. Due to this the T28 program was terminated in October 1947. 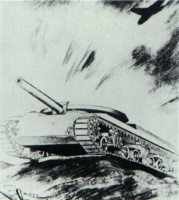 The concept drawing the T28 prototype is based on. Esta página fue modificada por última vez el 25 oct 2016, a las 10:33.